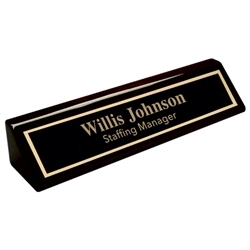 Desk Wedge Name Bars are an essential desk accessory for any business professional. Dress up you desk with one of our premium desk blocks. Available in your choice of ebony or rosewood piano finish. Your text is laser engraved on black metal. We can also print your logo along at no extra charge if provided in a high resolution vector art foramt (.eps or .ai).